I am still working on my class schedule for 2013. One exciting event will be a two day workshop by Joy Funnell and I am taking bookings now and this class is booking up, so get your booking in quickly. 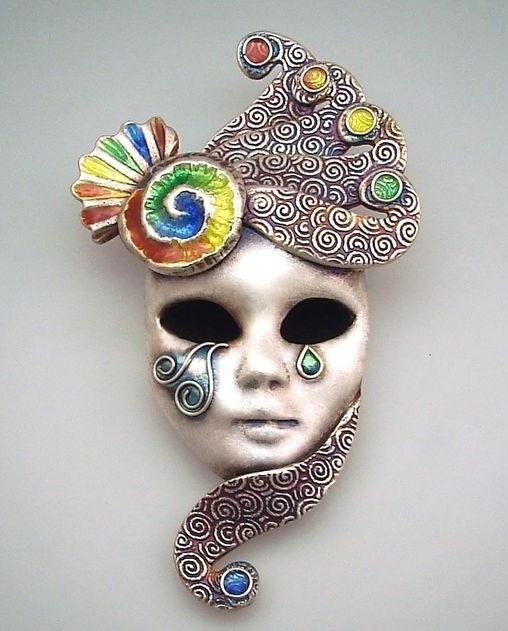 Joy Funnell is well known for her colourful silver and enamel Venetian carnival mask pendants. 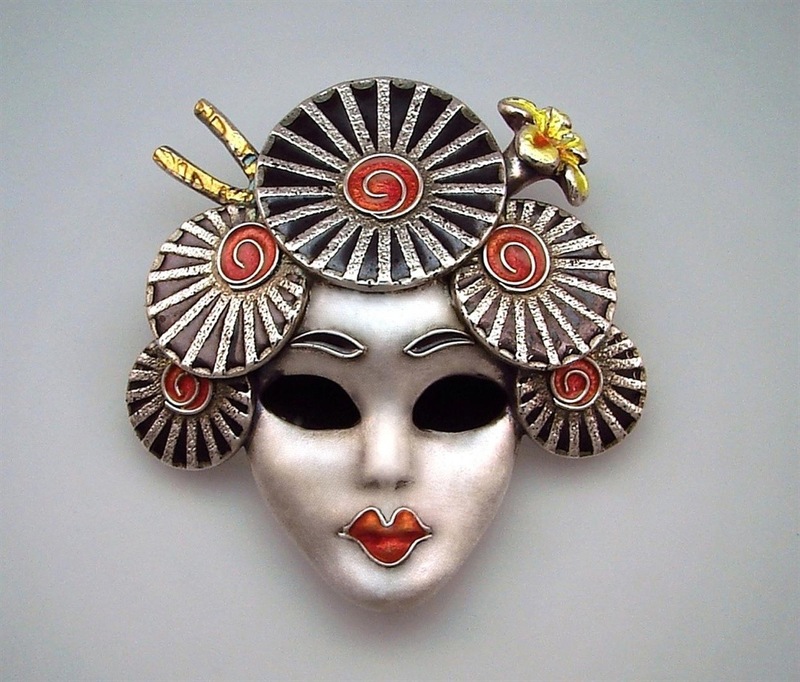 On this 2 day workshop you will learn how to create your own unique silver mask using Art Clay Silver. Then we will cover how to add wires to the mask for decoration before enamelling them to create your very own colourful carnival mask pendant. You will learn tips and tricks including creating the best surface on the silver for the enamel, making a three dimensional mask shape, making bails and decorating the reverse of your piece including setting small stones. Once the masks are fired and polished you will learn Joy’s unique Enamelled Accents technique for adding wires to make free standing cells for enamel. After covering how to prepare the enamels to get the brightest clearest colours you will learn how to wet lay them onto your piece and how different colour enamels can be used and blended together. Finally we will use patination to accentuate the bright enamel colours and the textures. During this workshop you will have a rainbow of enamel colours to use that you will be able to take home with you afterwards. Some previous experience with silver clay is necessary. Terms and conditions £100 deposit required to confirm a place, a further £100 payable two months before the commencement of the class and the balance payable by cheque or cash 14 working days prior to the first day of the class. 14 days notice of cancellation is required so that I can resell the workshop place. In the event of cancellation more than 14 days before the class the deposit can be carried over to another mutually convenient class. Cancellation by the student less than 7 days prior to a workshop will result in forfeit of your deposit and course fee. Each class has a maximum number of places available and a minimum number before it can run. If I have to cancel a workshop I will give as much notice as possible and a place will be offered for an alternative workshop at a future date. Refunds will be given in the event of tutor illness or insufficient numbers booked for a workshop. I reserve the rights to vary these terms and conditions at any time. My studio is based in the beautiful village of Glaisdale on the North York Moors, approximately 12 miles inland from Whitby. I can recommend B&B accommodation locally – email me for details and the booking form.